At Propr Design, we understand that the marketing landscape is shifting, and not about to slow down. It’s not about pushing brands onto consumers through big billboards and tv ads anymore. It’s about creating experiences, and building brand loyalty. Our team integrates branding, graphic design, digital marketing, web, copywriting, and content creation to evolve brands for the digital world. We recently just wrote a post on the importance of a strategy that integrates these pieces. "Propr is a results agency. The measurable growth of our clients' business is at the root of our efforts. To be recognized by Clutch as a top agency based on client feedback is not only a testament to our work, but evidence of what we demand from ourselves." 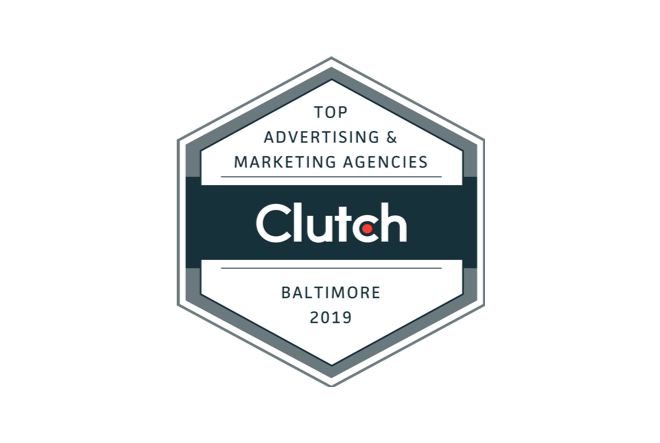 We are honored to announce that we have been selected as a 2019 leading design agency in Baltimore by Clutch! A key player in the tech space, Clutch is a B2B platform that provides in-depth reviews for firms featured on their site. They provide valuable information for firms seeking solutions outside of their core operations and connect them with firms like us that can provide high quality services. We are very excited to be included in Clutch’s research, particularly as one of the top graphic designers in Baltimore for 2019. This wouldn’t be possible without the participation of our clients. The feedback we’ve received in 2019 alone has been highly positive, and a great way to motivate our team and keep us driven for the rest of the year. Our Clutch reviews have also led to our presence on Clutch’s sister sites: The Manifest and Visual Objects. We have been named among the top branding agencies in Baltimore by The Manifest, which provides how to articles and other business news. One of our notable projects and our clients are also feature on our profile. Visual Objects displays the creative work of top branding companies and shows prospective clients what their own projects could potentially look like, thereby placing design at the center of a strong marketing strategy. Overall, we would like to thank our team here at Propr Design for dedicating their time and efforts to helping us become a 2019 leading agency in Baltimore. We remain dedicated to our clients and we continuously strive for exceptional value and service. We look forward to our future projects, and always ready to help a business with their digital transformation.